Beamish Quilt Collection Home Page : Friends of Beamish (North of England Open Air Museum). Photograph: Visitors admire one of the 350 quilts from the famous Beamish Collection. It seems a long time ago since 1970, when I was appointed as the first member of staff at Beamish. I had a wonderful opportunity to work with and learn about many of the collections, which Frank Atkinson had been busy building up over the preceding 10 years. A vast array of objects representing the material culture of the North East had been amassed including several quilts. From my youth I have always had an interest in textiles and remember well early visits to the textile mill of Stead McAlpin in Cummersdale near Carlisle, admiring the William Morris fabrics being printed there. Amy Emms, "That Wonderful Lady". My curiosity was awakened in the art and craft of quilting in the North East region, and I determined to find out more about the quilters and their quilts. A friend from home in the Carlisle area knew a "wonderful lady" who had just lost her husband, but who had taught classes in quilting. I contacted Amy Emms and persuaded her to come along to a Crafts Weekend in 1972 the date of the official opening of the Museum. This was one of the first such events Beamish had run. Amy never looked back and quilting became her life, being awarded an MBE in 1984 for "services to quilting". She always advised and encouraged me from the beginning. From these early days, I set about looking for quilts made in the region. During the 1960s a list of about eight working quilters existed, however, by the early 1970s there were few active quilters still producing any work to speak of. Press releases were sent out asking for information about working quilters but also looking for old quilts for the Museum's Collections. We were inundated with information and were offered many interesting quilts. Beamish Quilts are famous throughout the World. Since those days, the collection has grown and is now recognised both nationally and internationally as a collection of world importance. We have some 350 quilts, many of which have been exhibited in japan, USA and all over the UK. Many of the quilts have been published in numerous books on the subject. Indeed, Beamish's own catalogue sold out and another updated publication is in preparation. The quilts are so much more than art objects. They represent an integral and important part of the lives of everyday people of the region. They also tell us much about the social conditions of the time. Each quilt often has its own story to tell. A fascinating painting by Ralph Hedley, the well-known North Country Artist, depicts "The Wedding Quilt" of 1883. The painting illustrates three generations of the same family sitting around the quilting frame set up in a northern cottage. The grandmother gives advice to the young lady preparing the quilt for her "bottom drawer". The mother helps to place the templates and younger sisters assist by threading needles and doing some stitching. Ralph Hedley has certainly captured the scene accurately. Many quilts were made as wedding quilts and incorporated such symbols as the Lover's Knot, a continuous unending design symbolising a long and happy marriage. Other such quilts include motifs such as hearts and continuous cables and twists. Quilting - A Family Affair. Quilting was very much a family affair, both knowledge of the craft and quilting patterns being handed down from mother to daughter. Often friends would get together to work on each side of the quilt. Some women quilted for a living. The work would be carried out at home and would help to supplement the family income. A tradition of professional quilters grew up in Allendale in Northumberland. Quilt marking became a Business. In the later 19th century, George Gardiner of Allenheads developed a reputation for marking out the patterns on to quilt tops. The quilts would then be sold and would be stitched by another person. George's best known pupil was Elizabeth Sanderson who developed a school of professional quilt markers (called stampers) and many of these quilts survive especially her favourite design being the eight pointed star. The Rise of Quilting Clubs. Elizabeth's many pupils started to take apprentices and the tradition passed down several generations. In the latter part of the 19th century and early 20th century many quilting clubs came into existence in the pit villages of the North East. A club would be run by one quilter who would find about twenty clients to buy quilts. They would pay the quilter weekly until they had covered the full cost of the quilt. This enabled the quilter to buy all her materials and produce a quilt about every 3 weeks. Everyone paid about one shilling a week until about £3.10s.Od was collected. The Salvation of Many a Miner's Wife. Quilting clubs were often the salvation of many a miner's wife on hard times. Mrs Sally Ransom of New Seaham. a miner's widow was able to raise a family of four by making quilts and running a quilt club in the 1890s. Mrs Shepherd of Amble took up quilting when her husband was injured working in the pit. He was denied compensation and Mrs Shepherd ran a number of quilting clubs in order to make a livelihood for the family. She also made a fine quilt for her son in anticipation of his marriage in 1935, however, he never married and this fine quilt is now one of the Beamish collection. There are many more stories to tell but 1 hope that some of these will be told in the next edition of the book on quilts and coverlets in the Beamish collections. 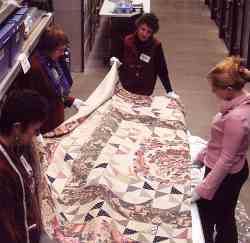 Storing and Researching the Beamish Quilt Collection. The storage of quilts, and indeed of so many quilts, is no straightforward issue. The Regional Resource Centre developed at Beamish in 2001 has enabled the Museum to store its collection in state of the art conditions, on a roller rack system some 5.5 metres high and in a controlled atmosphere. We have been greatly indebted to our quilt group volunteers who, over the last two years have checked, documented, and re-rolled the entire collection in acid free materials. This has been hard but interesting work and has given us an opportunity to study, re-photograph and re-assess the entire collection. Come along and See the Quilts for Yourself. The Regional Resource Centre also provides a Search Room, providing free access to the photo archive, reference library and computer database where photographs of the entire quilt collection can be studied. This facility is available Monday to Friday 9.00am - 4.30pm. Telephone:- 0191 3704000 ext 233. Enquiries are always welcomed and indeed the Museum is still filling gaps in the collections and is happy to give advice on quilts. Making the Beamish Quilt Collections More Accessible. The Museum are currently compiling a database of individuals and groups who would be interested in receiving more information about the Beamish Quilt Collection. Interested? Then please contact the Beamish Museum today. In a large store room four women stand around a large floral patterned quilt that is lying on a table. The quilt occupies most of the bottom half of the picture. It is light coloured in shades of pink, cream and brown with a large brown square in the centre and another around the border of the quilt. In the centre square there is a pink circular floral pattern with touches of cream and light brown. Top centre: A woman stands at one edge of the quilt looking towards the camera. She has dark hair and is wearing a dark red overall over a dark dress. The woman is holding up one corner of the quilt with her right hand; her left hand in on the quilt at centre - lying on the table. Right side edge: A woman stands looking at the quilt. She is touching the quilt on the table with both hands. She has auburn hair and wears a light pink top and dark coloured trousers. Left side edge: Two women - one behind the other - looking down at the quilt. The nearest woman has dark hair and is wearing a dark coloured suit. Another woman behind the first has ginger hair, she wears a blue top and is seen holding the quilt off the table with her left hand. Background: A brown floored passage can be seen that goes away from the camera and behind the quilt on the table between two banks of cabinets. Little more of the room can be determined. TEXT.